Let's be honest: most people are unhappy with at least some aspect of their physical appearance. Just think of all the money we spend each year trying to improve our looks! But if worrying about your appearance is getting in the way of living, maybe it's time to start thinking about body image in a completely new way. 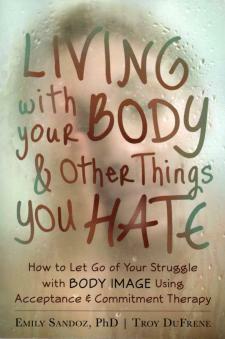 Based in proven-effective acceptance and commitment therapy (ACT), Living with Your Body and Other Things You Hate offers a unique approach to addressing your struggle with body image. In this book, you will not be told that your self-perceptions are wrong, that your thoughts are irrational, or that your feelings are misguided. Instead, you will learn to live with the reality that these often painful thoughts and beliefs about yourself will arise from time to time, and that what is really important is accepting these distressing thoughts without allowing them to dominate your life. You know what it's like to constantly be checking the mirror, to avoid certain social situations where your body may be exposed, or to gaze longingly at a fashion model in a magazine and think, “Why can't I be her?” But what you may not know is that people who struggle with negative body image are at an increased risk for depression, anxiety, eating disorders, and low self-esteem. Body image problems can even lead to major financial issues. By focusing on your appearance and little else, you are hurting yourself in more ways than one. If you are ready to find a purpose in life that is more important than the pain you feel about your appearance, this book provides a truthful, powerful resource.